Originally without the step, this was called "Single bent strip" until 1913, when it became the "Cranked Bent Strip". Post-war, the part was renamed "Bent Strip Stepped" but was not changed in its design. A strange little part, it's not absolutely clear why the cranked part is really necessary. It makes some sense for a couple of reasons. 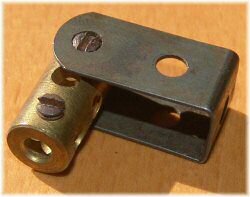 The part is designed to take a 1" pulley, which by 1913 gained a boss (although the loose pulley didn't). The narrow section might have been intended to keep cord on the pulley, but it's not narrow enough for that. 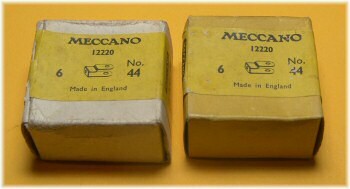 The narrow section is exactly the correct size to take a Meccano square nut and prevent it from turning, which is presumably as narrow as it could sensibly be made. Any suggestions how this is a great improvement from the previous part would be welcome! The part was officially discontinued in 1978, and the 1979 outfit 10 contained the new part 11a (exactly the same as the very first part 44) instead, which allows every 10-outfit model to be built. It's clear from the discovery of the shape of the earliest (non-cranked) single bent strips that it was decided to keep the narrow 'closed' end the same shape, and add the cranked side to allow bossed parts to fit. It's not quite so clear why the crank was added instead of taking the simpler option of creating what eventually became the part 11a, five decades later. The first single bent strips were not cranked (or stepped) at all, but were similar to the modern part 102 (single bent strip). First available in 1904, they are documented as being dropped in 1906 and reintroduced in 1910 by EMP, but I believe that this is a mistake due to the existence of a misprinted 1906 parts listing shown in the Love & Gamble book. In that listing (p344) the part below "Ball of Cord" is shown as "Book of Instructions", whereas in the 1906 manual for the X outfit, it is shown as 1 of "Bent strip", required for the endless rope railway and clearly visible in the photograph of this model on page 28. Thanks to John Nuttall for reminding us about this, and finally spotting the offending article! Now all we need is a photograph! This first "Bent strip" had rolled tinplate edges (being a 2½'' strip bent over), until at least late 1907. The same applies to the "Bent strip, large", later to be named 2½''x1'' double angle strip. The best picture we have to date is in the book "Factory of Dreams" on page 35. Here, Jim Gamble's 1908 outfit is shown, with the bent strip clearly visible next to the hank of cord. Strangely, this is an MME-type strip with rolled edges on the inside, but of course all the other parts are solid steel strips. It's possible that this part found its way in to the outfit later, and so this only shows us what the MME part looked like but doesn't prove that the part still existed in 1908. However, the 1908 manual clearly lists the part as "bent strip" and shows a photograph of it in the endless rope railway. We would have to assume that the part should be formed from a contemporary 2½'' strip. I have recently come across a reasonably convincingly dated outfit from 1911 containing a couple of wider versions of this part, in between the thickness of the later parts 11a and 102 (i.e. less than half an inch wide but more than the single bent strip shown above). This part is shown left, and you can see that it is precisely wide enough to take a coupling, solving a confusion in the later part 102. The cranked shape was introduced in 1913, with a distance of around 9mm from the base of the part to the crank. In 1926 there was a subtle change, with the crank moving up about 1mm or just over, as you can see from the two parts in the photo to the right. All coloured parts have the same form as the right-hand version in this photo. Here's a strange fact. 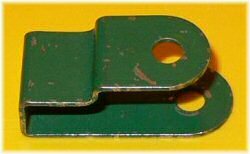 The cranked bent strip is made from an original part that's a very odd length for Meccano. Very occasionally we find one of these that made it out of the factory before it was bent. Staffan Kjellin sent us this picture of an unbent part 44, lying on top of a 2½'' perforated strip, showing that it's actually 2.6'' long, with the left-hand two holes at 1.1'' centres. This allows the final part to be precisely the same length as part 102 (the single bent strip), with the additional tenth of an inch being the step out. And another mistake shown to the left – a cranked bent strip bent the 'wrong way'. The unbent strips obviously had to be fed into the bending process the correct way around, but this one was fed in wrongly and the short side has had the crank added to it, making the two legs different lengths. To the right are two spare parts boxes, the white card version is early 50's, the yellow one slightly later (but obviously before 1958, as the label is still yellow signifying medium green parts inside). My 1600 doesn't have a flicker, but it does have a brush that it twice as long, and does a zig-zag pattren over the brush during the cleaning cycle. I've noticed that the P400 falls off the nozzle and brush cleanly, but the PA-747 stuck like crazy and then melted. Fortunately, the excess MG47 filament seems to be brushing off the nozzle quite cleanly (maybe not as good as the P400, but certainly an improvement on the PA-747). It is difficult if not impossible to get a spanner on to a nut in the base of any of the bent strips and if an axle is running through it impossible to get a screwdriver onto a bolt in the base. It is often used as bearing for a short axle and there is no way of fixing it firmly except by screwing the base nut and bolt very tightly. Hold the part in position with one hand and the screwdriver in the other - no hand left for a spanner. Your first guess that it is the size to be a self acting spanner probably the right answer. Reply: Yes, probably, but I still don't understand why they bothered to design it for use with a bossed pulley, when they already had the bossless version that would have worked fine with a part 102 (which is what this used to be before the cranking). 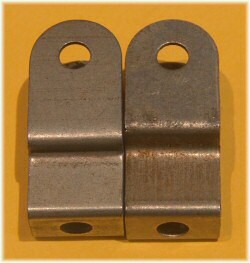 For all other purposes, the offset hole isn't as useful, and the design requires a unique stamping as shown above. That's why I don't understand why they did it.